You might know him from Hefner but Ant’s website reveals a long history packed with DIY pop gems (Birds… is his third album proper but there’s an impressively long trail of singles, EPs, and compilation contributions). His brand of indiepop is charming, intimate (he could be singing directly to you) and sweetly melodic. It could be, but isn’t, tooth-rottingly twee: ‘Lady Grey’ may be a love song to the delicately scented tea (probably) but it packs a soulful Tropicalia punch, using electric piano and swaying percussion, and sounds like Caetano Veloso and Rodriguez. Elsewhere, ‘Such A Pretty Sight’ is so darned catchy it’s caused a melody shortage in the rest of Southern Sweden. Mostly it’s just Ant playing everything, his lyrics painting him as a shy, romantic but forensic observer a la Nick Drake, and creating easy, shuffly, folky rhythms of the sort that Herman Dune did so well, then binding everything with the loveliest melodies (this boy has a sweet tooth for pop). ‘Kisses On A Plate’ pulls all those things together, a naïve hook-strewn love song that absolutely radiates charm. This was recorded at home in Sweden and at Darren Hayman’s gaff in Walthamstow, a lot by himself and occasionally with old friends. It’s reassuring that they continue to make good music together; ‘Fireworks In This Small Town Tonight’ is a declaratory alt-country love song, beautifully inked in by Jack Hayter’s pedal steel and Dave Watkins’ banjo, while ‘Oh What A Day. (Oh What A Night)’ is a gorgeous miniaturist gem on which Suzanne Rhatigan’s Wurlitzer piano stands out. 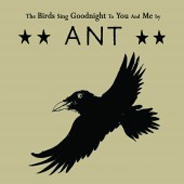 Ant makes pretty shapes out of mostly-acoustic indiepop, and Birds… contains some of his best work to date. His career might have followed a fairly shallow trajectory to date but this is where he takes flight.